Guru Purnima means the “Full Moon of the Guru”. In Sanskrit, “Gu” means darkness, “Ru” means remover, thus Guru Purnima is the occasion where all the ignorance in our mind are eliminated and the path for wisdom is paved. This year, Guru Purnima festival falls on Friday, July 15th 2011. There goes an adage “A good teacher is like a candle – it consumes itself to light the way for others.” This is no exaggeration since teachers dedicate their entire life towards educating the pupils and thus enlightening and developing the upcoming society. Students and disciples convey their gratitude to their gurus and thereby gain immense intelligence and learning ability on the sacred occasion of Guru Purnima. Jupiter is the celestial teacher of mankind governing spiritualism and religion. The term Jupiter represents excellence and He is the teacher and the crusader of life. It is very essential to convey our thankfulness to Lord Jupiter on this sacred Guru Purnima occasion. Astroved is conducting Abhishekams and Archanas at the 3 Most Powerful ‘Guru’ spots or Jupiter Temples in Tamil Nadu: Thiruchendur, Alangudi and Thiruvalithayam on this upcoming Guru Purnima. Radha Krishna is readily available to be your Guru during this Guru Purnima. Radha and Krishna are the avatars of Goddess Lakshmi and Lord Vishnu who take the lead in imparting knowledge about worldly success through love, and thereby bestowing divine wisdom. This Guru Purnima, a special ceremony re-enacting their divine marriage will take place at a little known, remote and very small shrine in Tamil Nadu where the couple are said to have joined in union. It is difficult for human beings to practice unconditional love. All human love is conditional and agenda orientated and lead to despair and darkness. 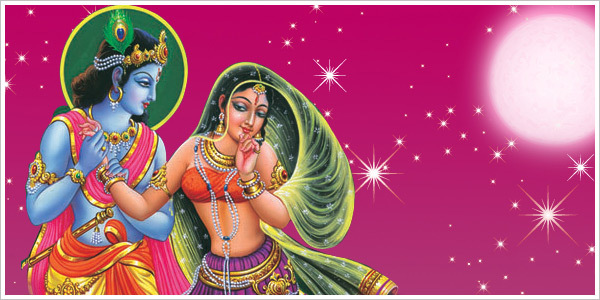 But regular worship of Radha-Krishna can bring lots of happiness, wisdom and well being into our life. Astroved presents a special “Dancing Radha Krishna Statue” featuring a unique and rare form of the pair. Throw a few petals of Tulsi leaves over the statue on a daily basis or whenever possible and be initiated into the secret of unconditional love and manifestation of an effect without a cause. Celebrate this Guru Purnima with Astroved by participating in the reinactment of the Wedding Ceremony of Radha- Krishna that will lead to spiritual and material success.